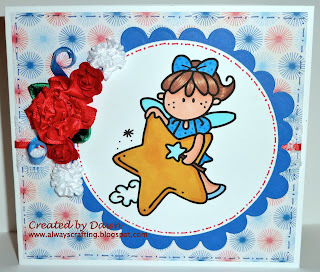 It is time for another challenge at Paper Playtime and this weeks challenge is Red, White and Blue! Come on over and enter you card HERE. There are lots a great prizes to win! 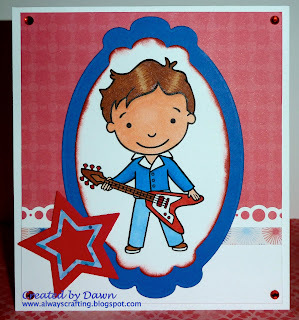 This image called "Billy Rockstar" from Pink Cat Studio. This image called "Wee One Fairy - Big Star" from Bugaboo Stamps. The design team had a lot of fun creating cards for this challenge so please check out their work. A bid thank you for our sponsors Pink Cat Studio and Bugaboo for the lovely images to work with for this challenge!